Ligaments are strong bands of fibrous tissue which connect bones to bones. The scapholunate (SL) ligament connects the scaphoid bone to the lunate bone in the wrist. It is as important as the ACL in the knee. The scaphoid and lunate bones are two of the eight small bones of the wrist, called “carpal bones.” The carpal bones are aligned in two rows: the scaphoid, lunate, triquetrum, and pisiform bones comprise the proximal row; the trapezium, trapezoid, capitate, and hamate make up the distal row. Ligaments help to stabilize the normal alignment of these bones in the wrist. Injury to a ligament occurs along a spectrum of severity: from a mild “sprain” (partial tear) to a complete tear or rupture. Significant tears of the SL ligament can lead to abnormal alignment of these bones and altered wrist mechanics and instability. SL ligament injury can result in abnormal gapping between the scaphoid and lunate bones. This is known as “scapholunate dissociation.” The bones also rotate abnormally after SL ligament tears, with the scaphoid rotating forward, and the lunate rotating backwards. This condition is known as “dorsal intercalated segmental instability” or “DISI” deformity. An SL ligament injury can occur from a variety of causes including sports injuries, falls, and motor vehicle collisions. However, the most common scenario is a fall on an outstretched arm in a young adult, causing the wrist to forcefully bend backwards (hyperextended). It is common for people to overlook the injury at first, thinking that the injury was a simple “sprain.” Often the diagnosis is delayed a few weeks or months, and the injury can become chronic. Occasionally some people cannot recall a specific injury but report reduced range of motion or pain in the wrist with heavy activity, such as push-ups, lifting weights, or forceful gripping. History, physical exam, and x-rays are important for diagnosing an SL ligament injury. During the physical exam, I will evaluate range of motion, tenderness, swelling, and stability of the wrist. 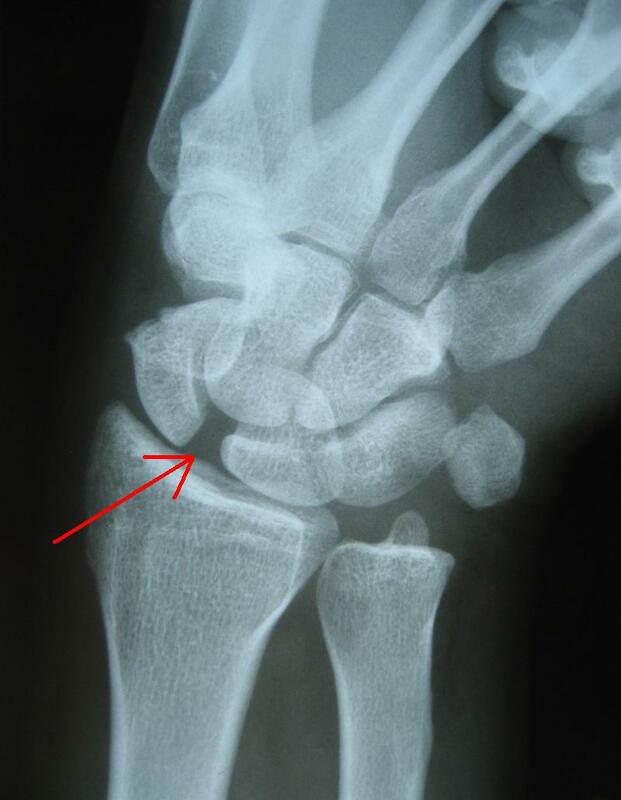 X-rays can show gapping between the scaphoid and lunate bones, as seen below. If the diagnosis is not clear on standard wrist x-rays, “stress views” can be obtained. During a stress x-ray, the patient makes a tight fist. Stress views may demonstrate gapping of the wrist bones which occurs during physical activity, but not at rest. Comparison x-rays to the uninjured wrist are helpful in these cases. An MRI can be ordered if the diagnosis is still unclear after x-ray evaluation. The normal function of the wrist is dependent on the complex arrangement of bones, ligaments, joint capsule, and tendons of the wrist. Under normal circumstances, there is a balance within the wrist allowing for normal function and good range of motion. With an injury to the bones or ligaments, this balance is disturbed. This can result in pain, loss of motion, swelling, and abnormal wrist mechanics. Over several years, abnormal mechanics in the wrist can lead to accelerated “wear and tear” of the joints, leading to post-traumatic arthritis. The normal smooth cartilage which allows pain-free mobility between joints wears out. The pattern of wrist arthritis after a SL injury is termed “scapholunate advanced collapse” or SLAC wrist arthritis. Partial SL tears: In cases of a partial tear, no instability of the wrist is identified on x-ray or physical examination. Treatment of acute partial SL injuries involves rest, immobilization in a cast or brace, and pain control followed by rehabilitation and strengthening. In chronic partial tears of the SL ligament, an arthroscopy (“wrist scope”) can be performed if symptoms are persistent. During wrist arthroscopy, the SL ligament injury can be evaluated and the wrist joint is fully inspected for other joint or ligament damage. A partial tear of the SL ligament can be debrided (“cleaned up”) to reduce pain. Dynamic instability: Dynamic instability is diagnosed by stress x-rays when standard wrist x-rays are normal. Widening or gapping between the scaphoid and lunate is accentuated during the stress view. This condition results from a complete tear of the SL ligament. Most surgeons recommend surgery to improve the mechanics of the wrist, as described below. Wrist arthroscopy: The goals of wrist arthroscopy are to reduce pain, evaluate the degree of SL tear, and assess the wrist for arthritis. This surgery is useful in cases of partial tears, or if the diagnosis is in question. It is performed as an outpatient under anesthesia. Through small incisions on the back of the wrist, a small arthroscopic camera (wrist scope) is placed into the wrist joints. The wrist can be visualized well with this technique and partial tears of the SL ligament and joint synovitis (inflammatory tissue) can be debrided. Debridement is the process of removing damaged tissues to promote the healing potential of remaining tissues. If significant instability of the SL ligament is recognized during arthroscopy, temporary pins can be inserted to stabilize the wrist. Rehabilitation and splinting after surgery depends on the intra-operative findings. SL ligament repair surgery: The goals of surgery for dynamic or static instability are to reduce pain, improve function, and restore wrist alignment. An incision is used on the back of the wrist in order to expose the carpal bones and evaluate for arthritic damage. The carpal bones are re-aligned and pins are inserted into the wrist to hold the bones in place. Intra-operative x-ray called fluoroscopy is used to confirm the alignment. The SL ligament is repaired using sutures anchored to the bone. If the SL ligament cannot be repaired satisfactorily, which is common in chronic cases, many hand surgeons reinforce the repair with either a capsulodesis or ligament reconstruction. These procedures involve anchoring a portion of the wrist capsule to the scaphoid to prevent abnormal rotation and gapping of the bones or using a tendon as a graft to reconstruct the ligaments. After outpatient surgery, the wrist is protected in a plaster splint. The splint and skin sutures are removed in clinic after 10-14 days. A fiberglass cast is applied to the wrist in order to protect the repair for about 8 weeks. The pins are removed either in the office or in the operating room after about 8 weeks from surgery. Once the cast and pins have been removed, hand therapy is important to improve wrist range of motion and strength. Rest and elevation of the hand to the level of the heart is very import for the first few days after surgery to reduce swelling. I encourage gentle finger range of motion to help prevent digit stiffness. Shoulder and elbow range of motion exercises are also important to help prevent stiffness in these joints. Adequate nutrition is important during the healing and recovery process. Please do not smoke. Not only is tobacco damaging to cardiovascular and pulmonary tissues, it inhibits soft tissue and bone healing. If you smoke, the risk of delayed healing and infection are higher. There are risks with any surgery. Possible complications include pain, bleeding, infection, swelling, stiffness, arthritis, pin breakage, pin-site infection, and damage to nerves and blood vessels. The pins can irritate the radial sensory nerve, causing numbness and/or pain in the thumb. Other complications are also possible but are uncommon.